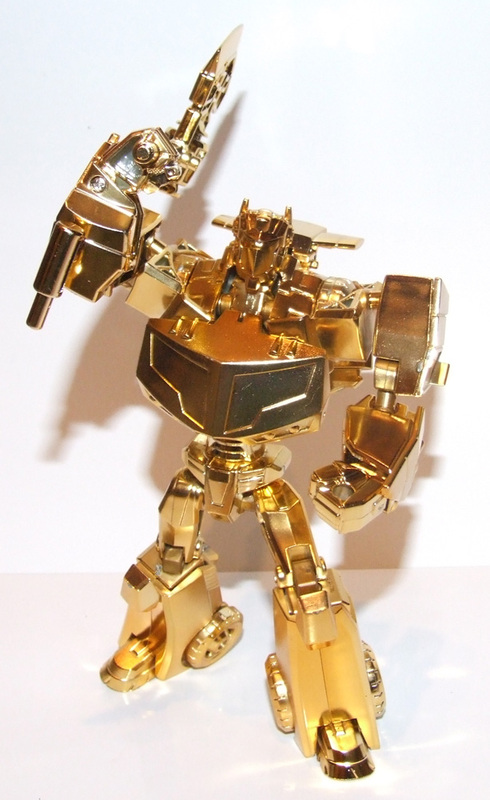 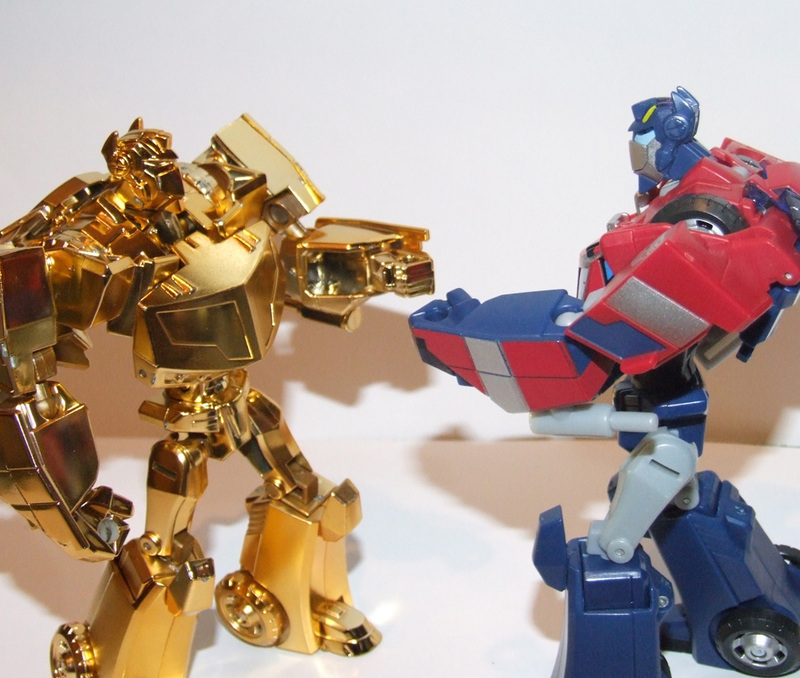 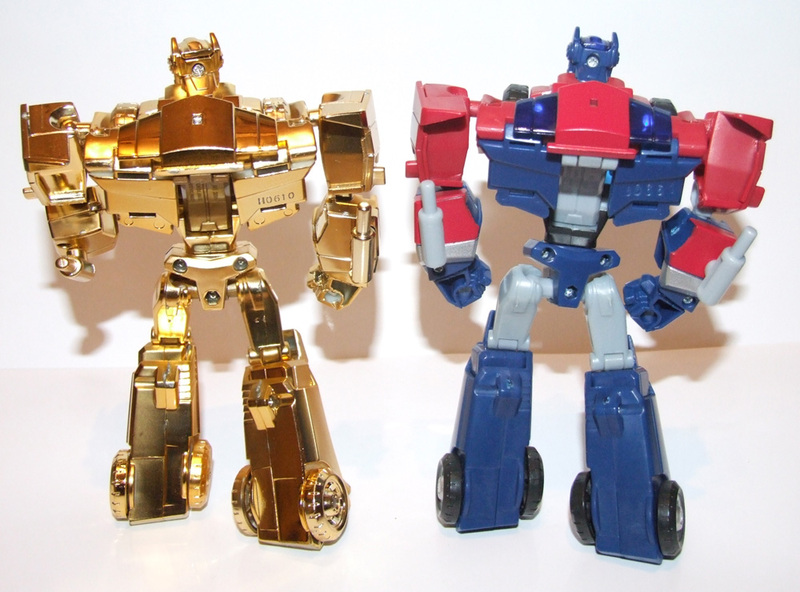 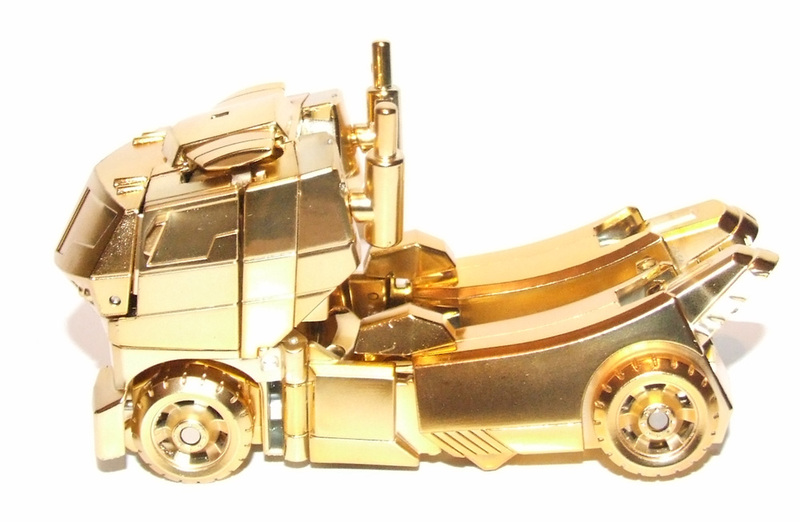 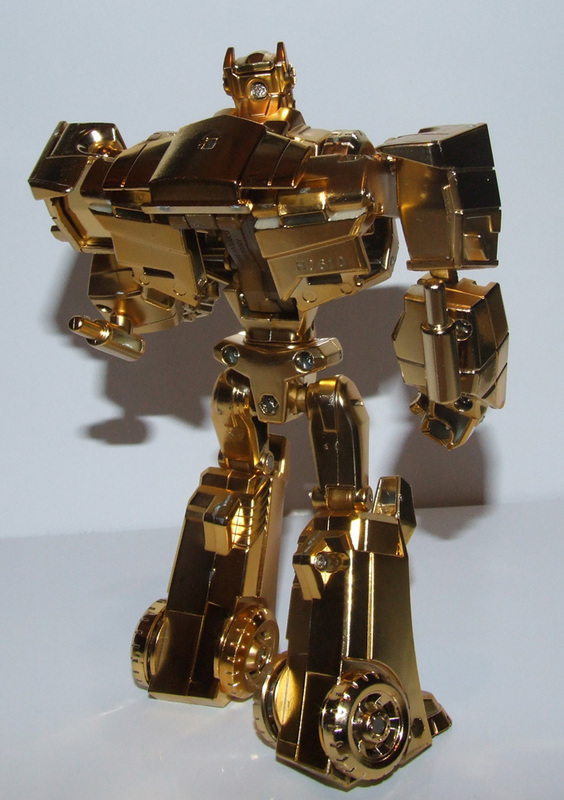 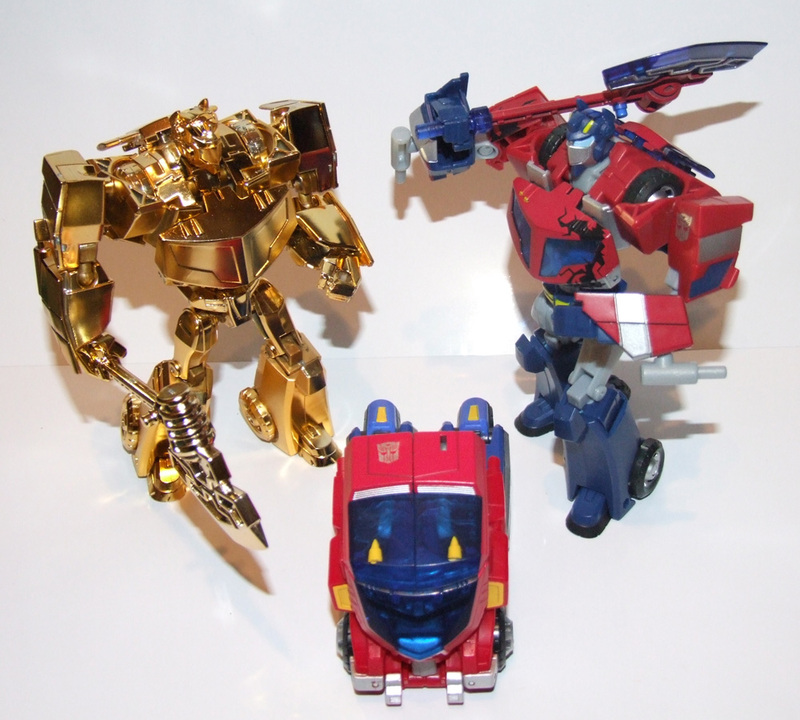 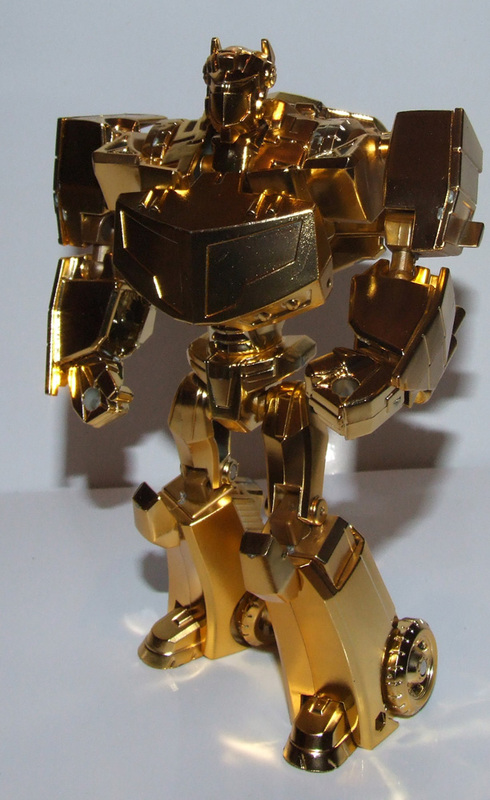 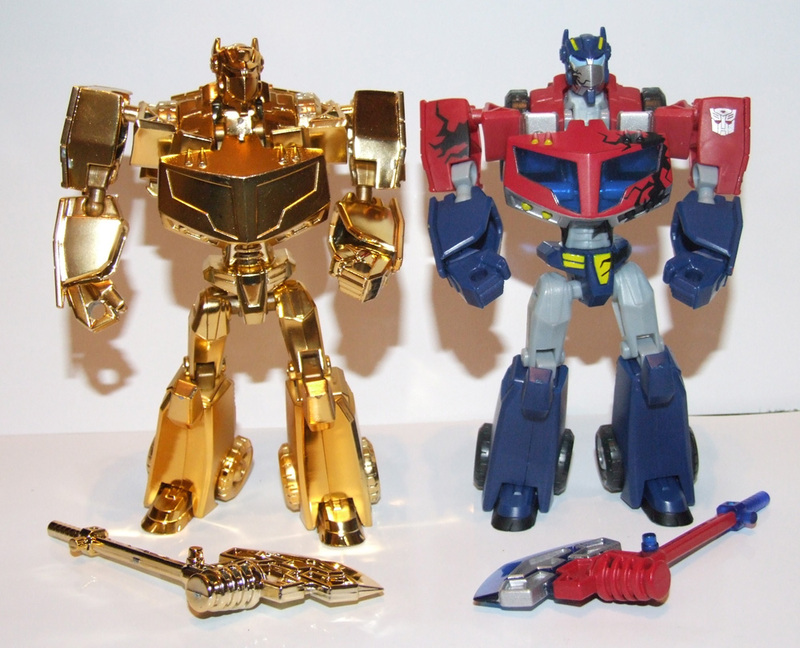 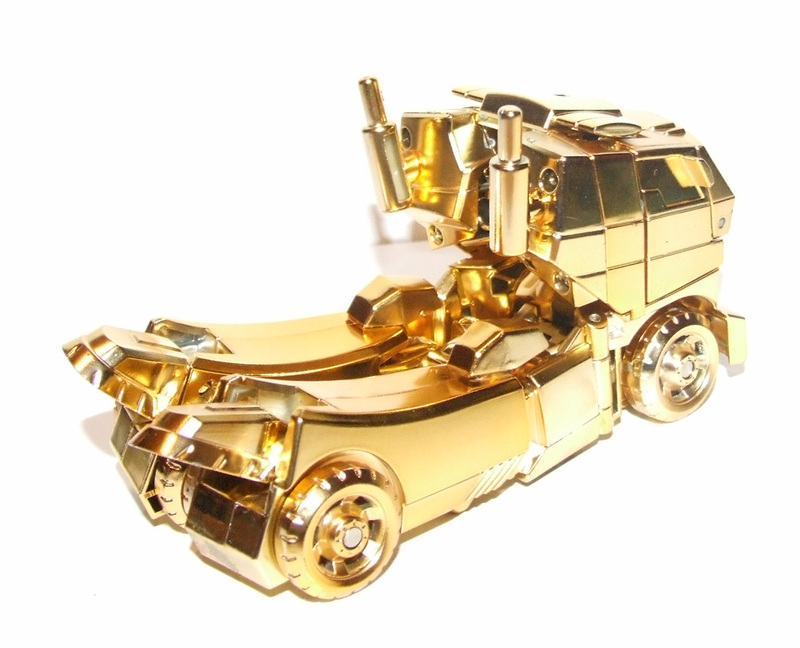 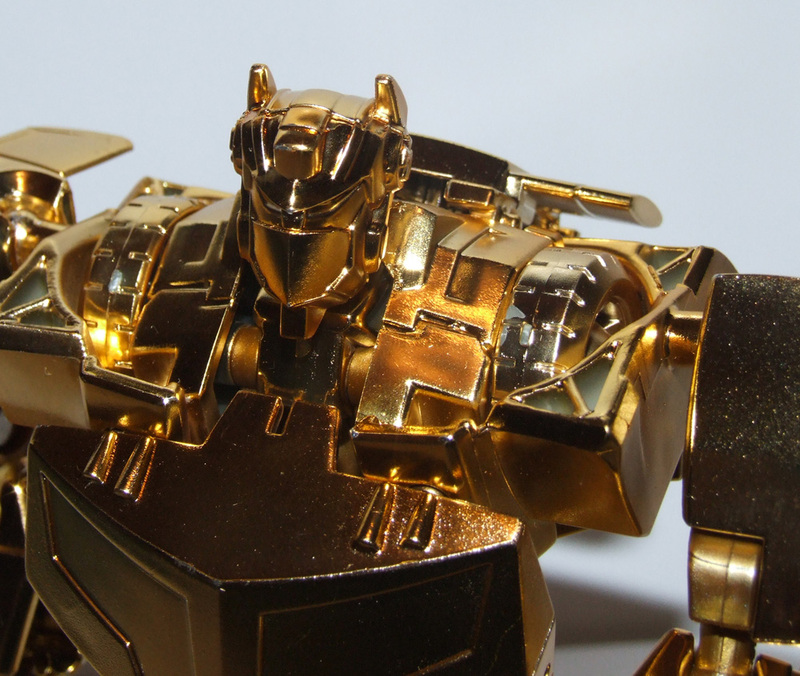 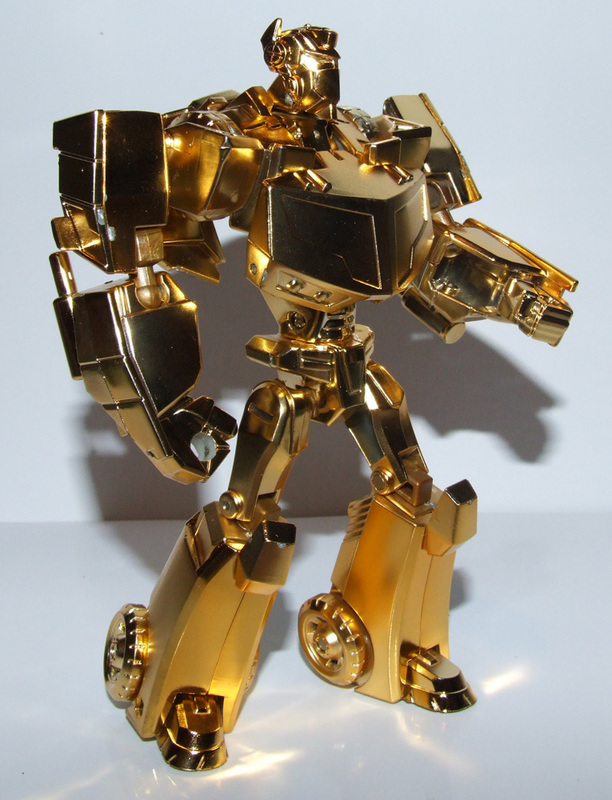 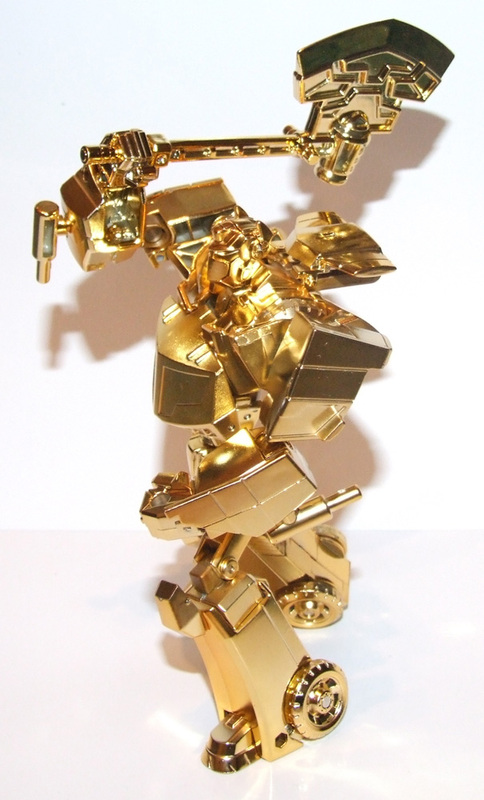 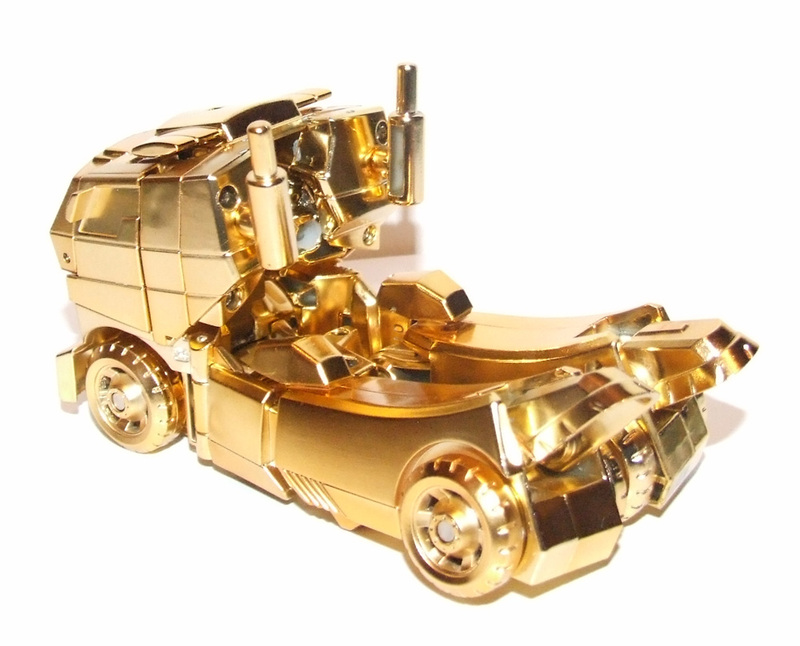 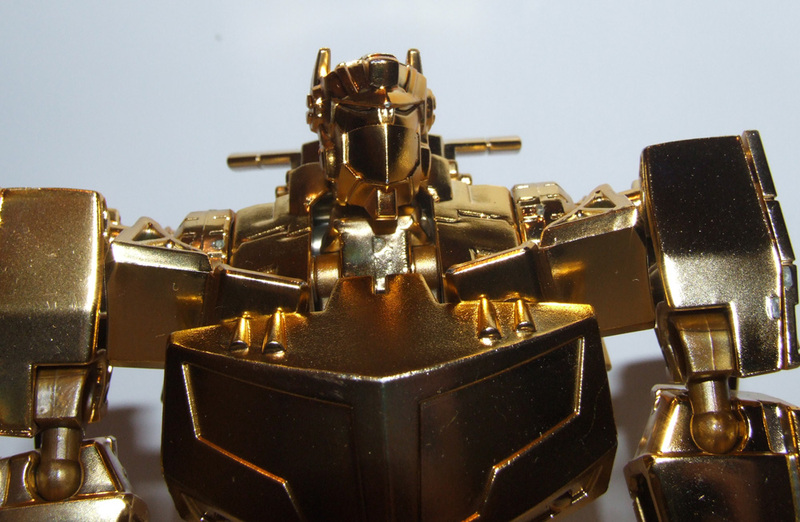 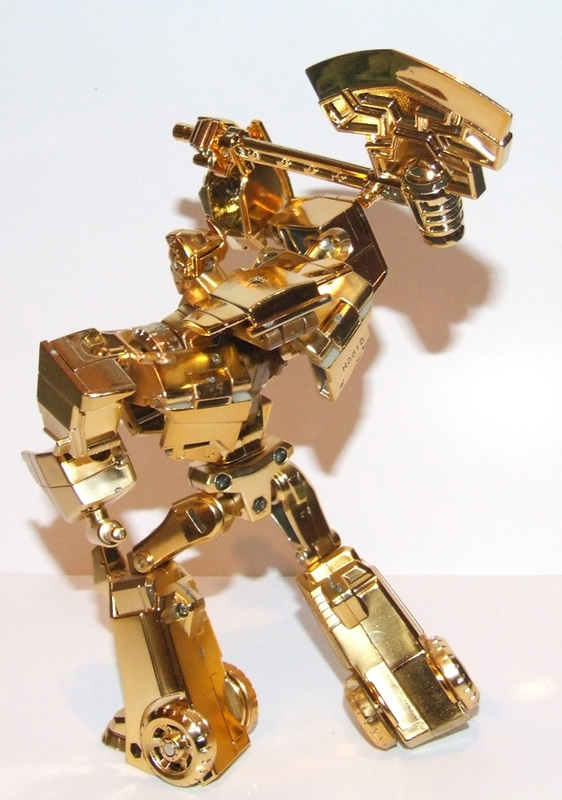 When Japanese Transformers Animated volume 1 DVD was announced in May 2010 it was also announced that a campaign would be run by TakaraTomy in partnership with both Mountain Rose and Sega to give away 1000 gold chrome deluxe Optimus Prime figures. 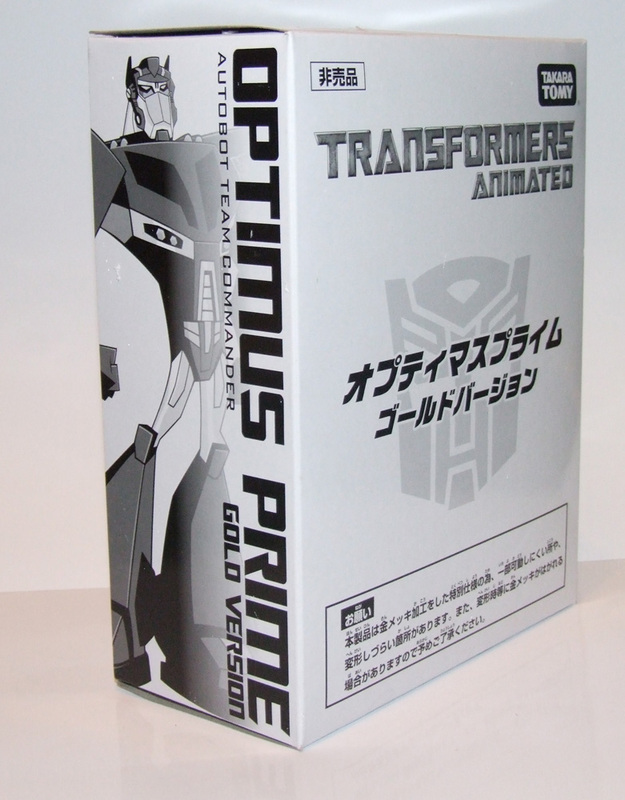 The DVD's were due to be released by Paramount on the 6th August 2010 with the campaign for the figures due to run between the 18th August and the 30th September 2010. 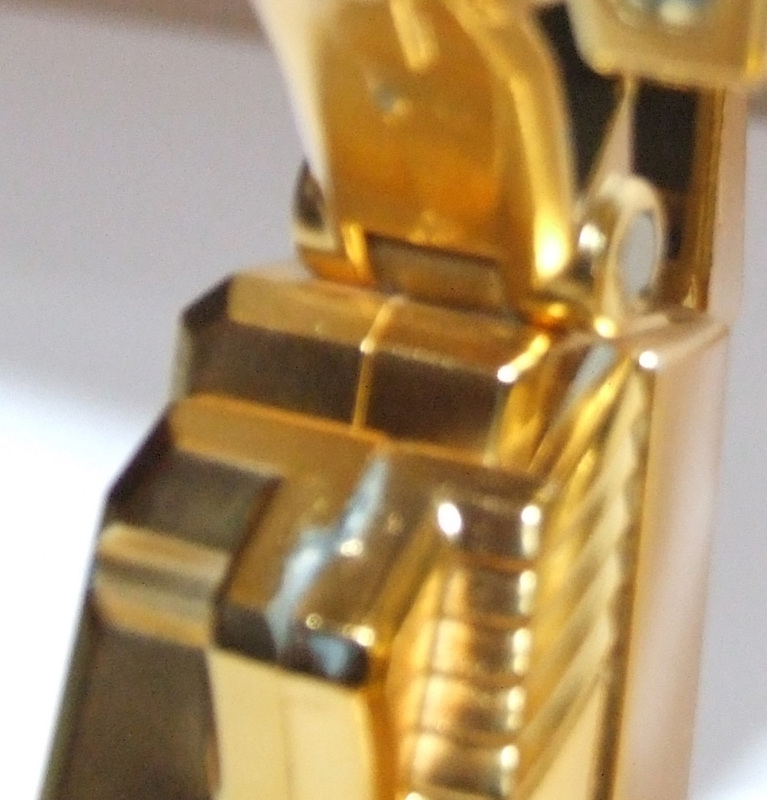 The figure was subsequently shown publically during various Asian events during the summer, a rarity for Lucky Draws. 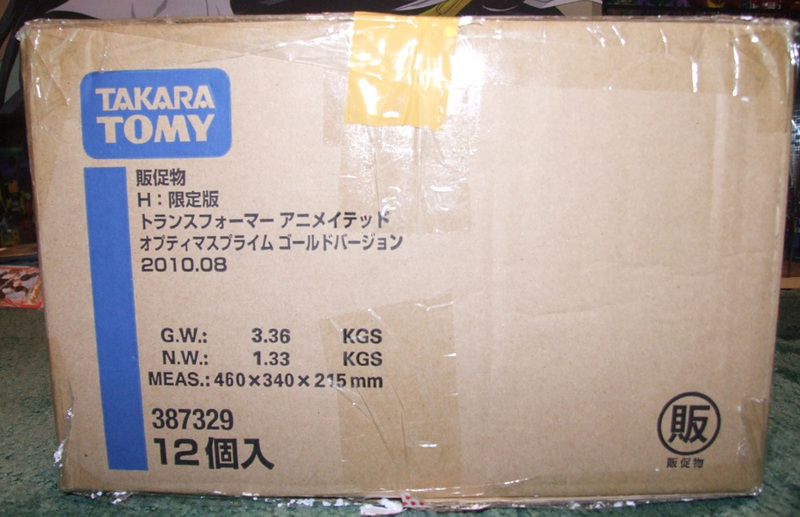 Towards the end of August 2010 the figures bgan finding their way to sellers in China, Japan and Hong Kong. 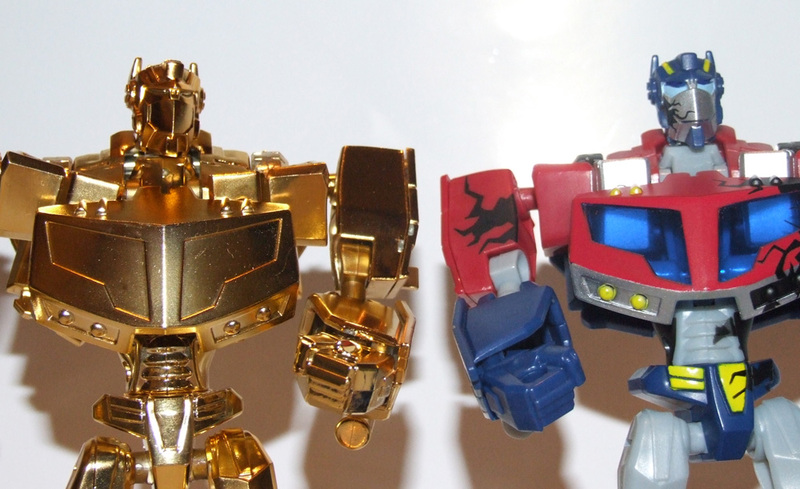 These toys were then sold on to collectors via private sales, eBay, Yahoo Japan and Taobao Auctions. 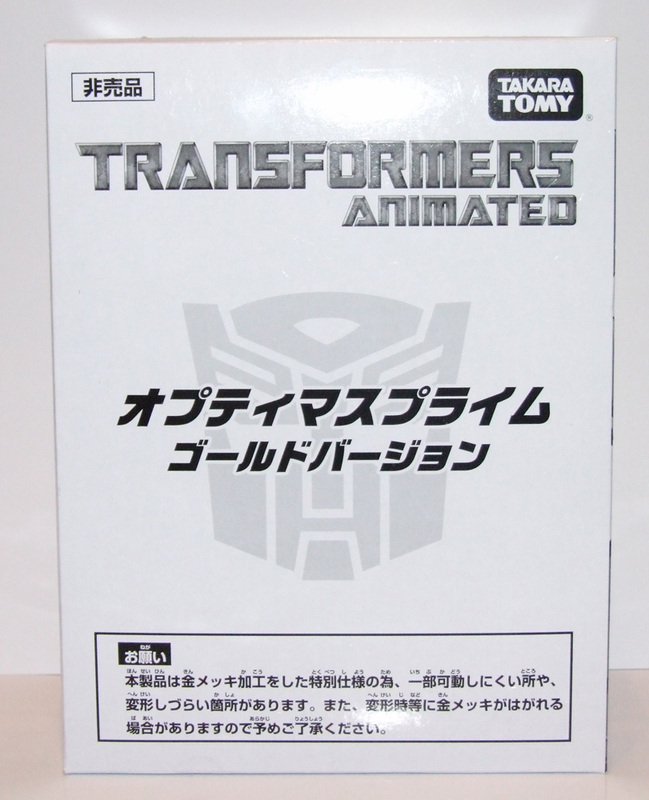 Transformers At The Moon picked up the first figure that became available (privately) from KOToys.com as well as the actual case that the toys shop ship from TakaraTomy in. 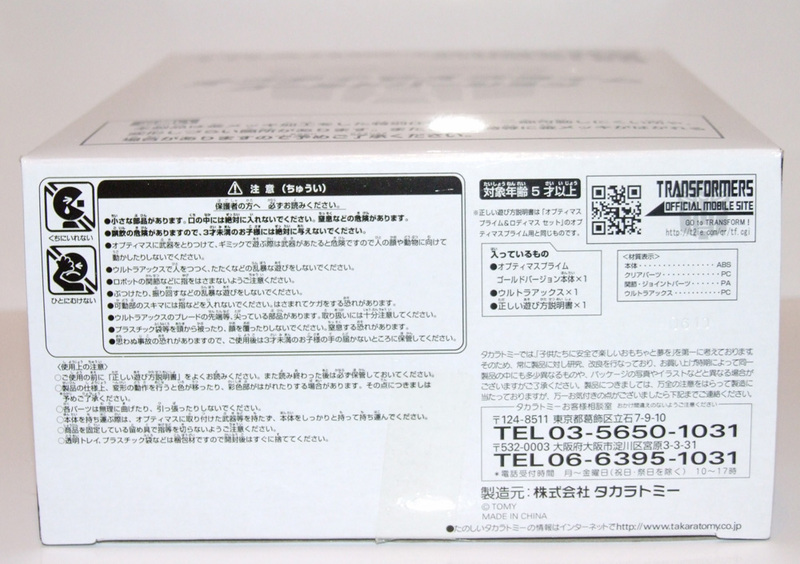 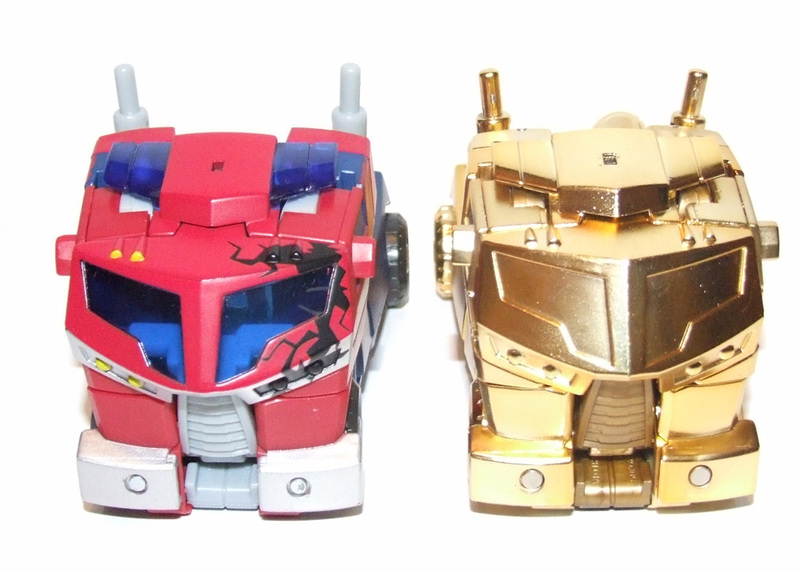 By doing this, it has enabled this website to exclusive beable to reveal that the figures ship in cases of 12 and that 92 cases were made and shipped from the TakaraTomy factories. 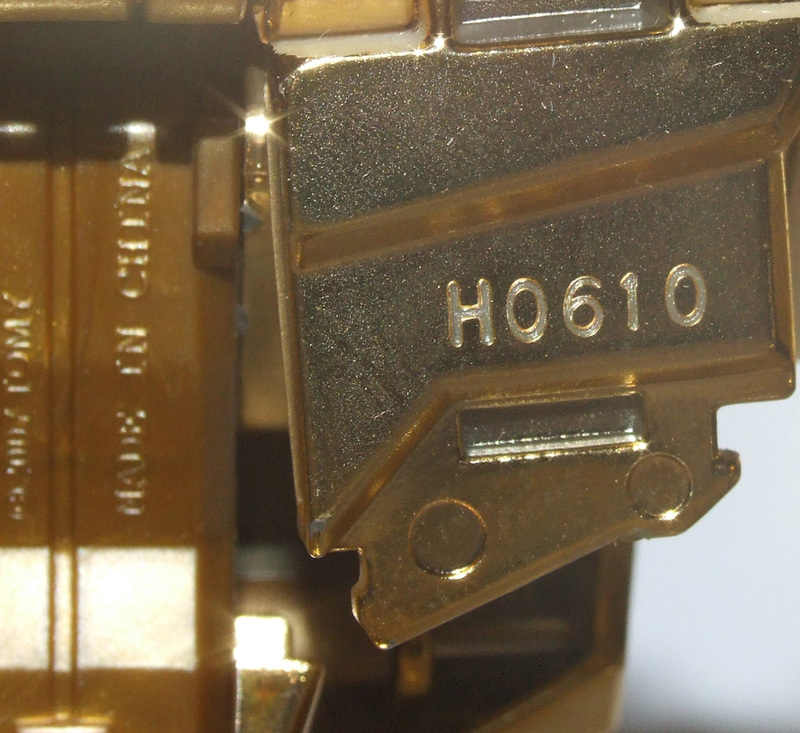 Evidence of this can be seen from by looking at the photographs contained within this gallery. 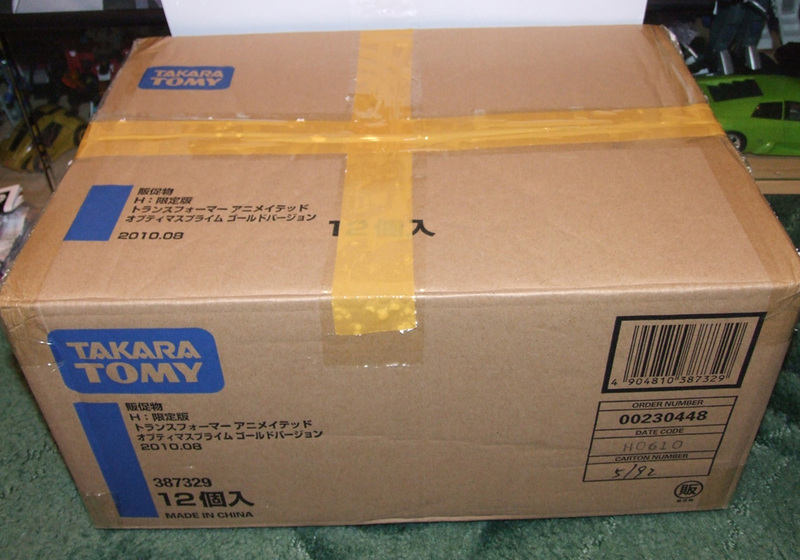 We have blacked out the number of the case box that we own, but you can still see the handwritten 92. 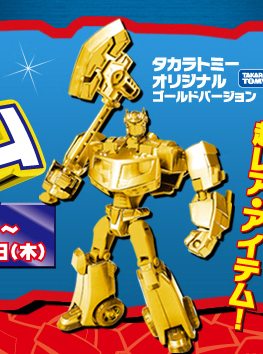 This means that 1104 toys were made and sent to distributors by TakaraTomy. 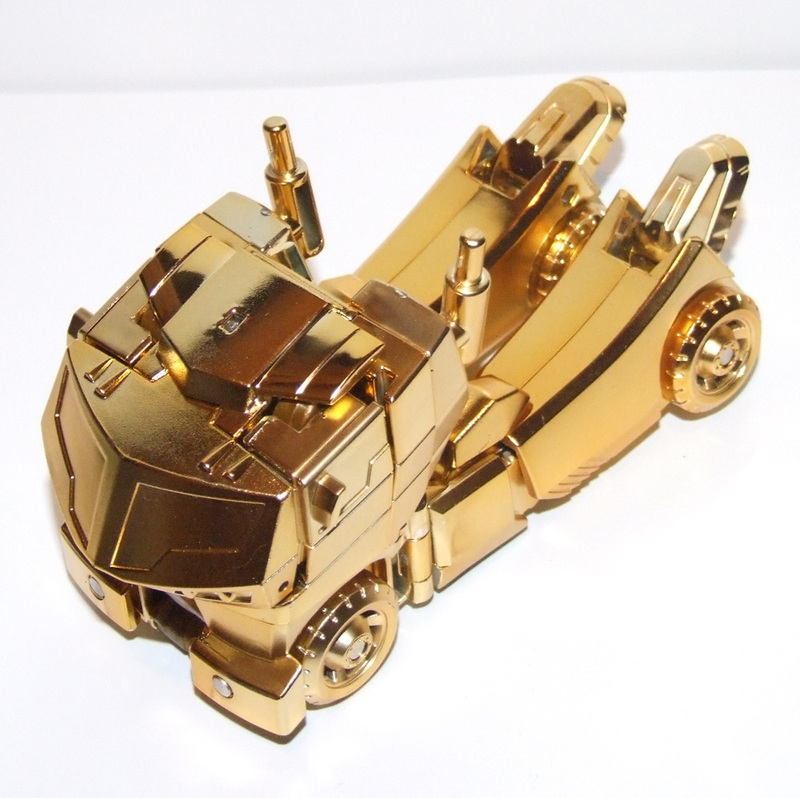 Of those, 1000 pieces will be given away as per the campaign and we expect the other 104 pieces were to be distributed to staff and amoungst the workers. 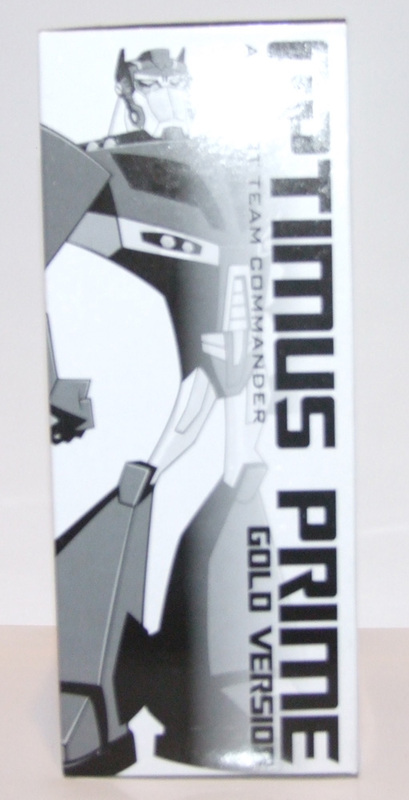 There were also a number of pre-release items made that were shown at the conventions. 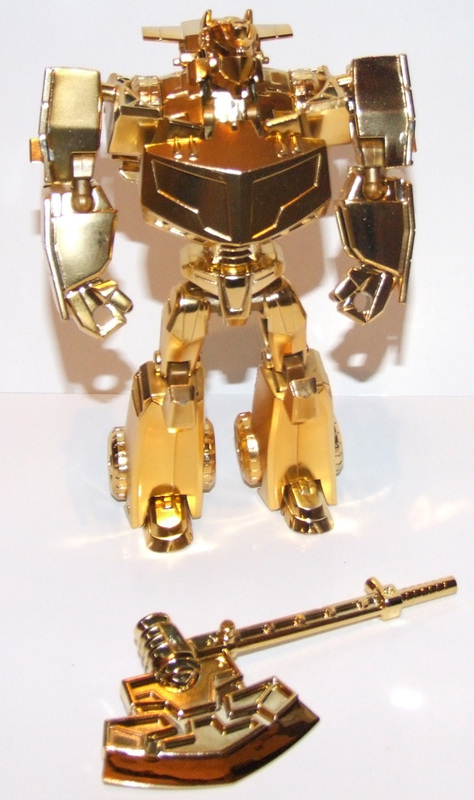 As of September 2010 the toy has sold for prices between $350 and $550. 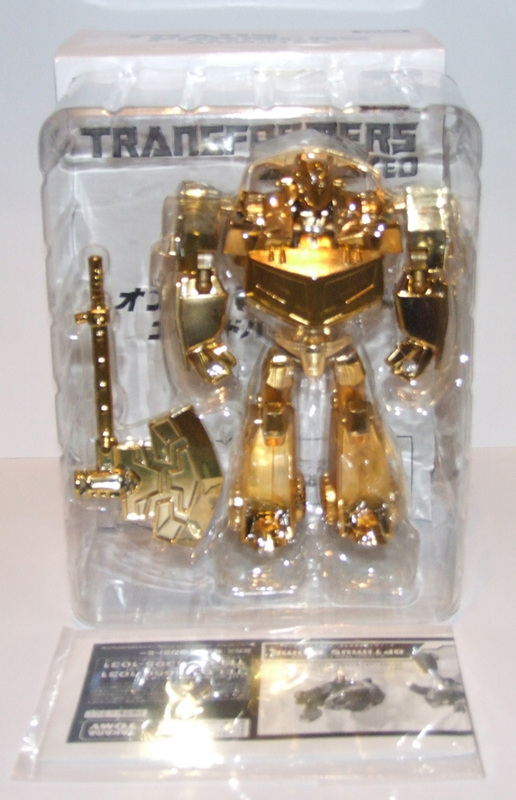 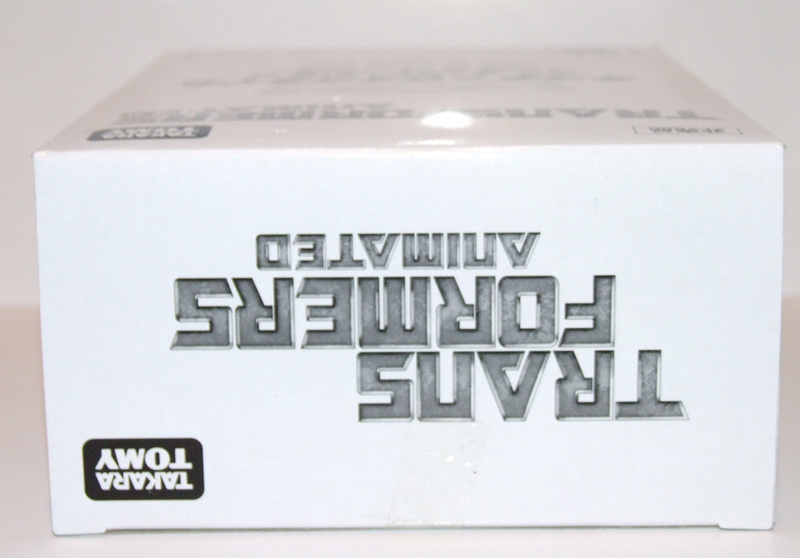 The writing on the box translates as "Transformers Animated Optimus Prime Gold Version"
Before I start to review the toy, I must remind you that I am a big fan of Transformers Animated as you would expect from someone that owns and runs TransformersAnimated.com. 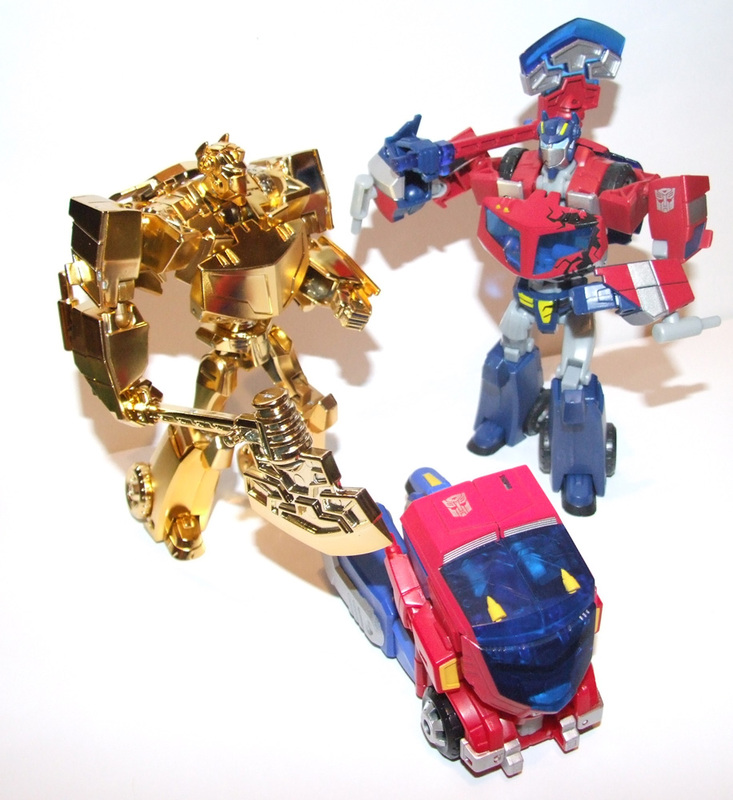 Last month (August 2010) it was my pleasure to be able to bring Derrick J Wyatt (The father of Transformers Animated), Jim Sorenson and Bill Forster (who gave the world the excellent Allspark Almanacs) over to the UK for Auto Assembly 2010. 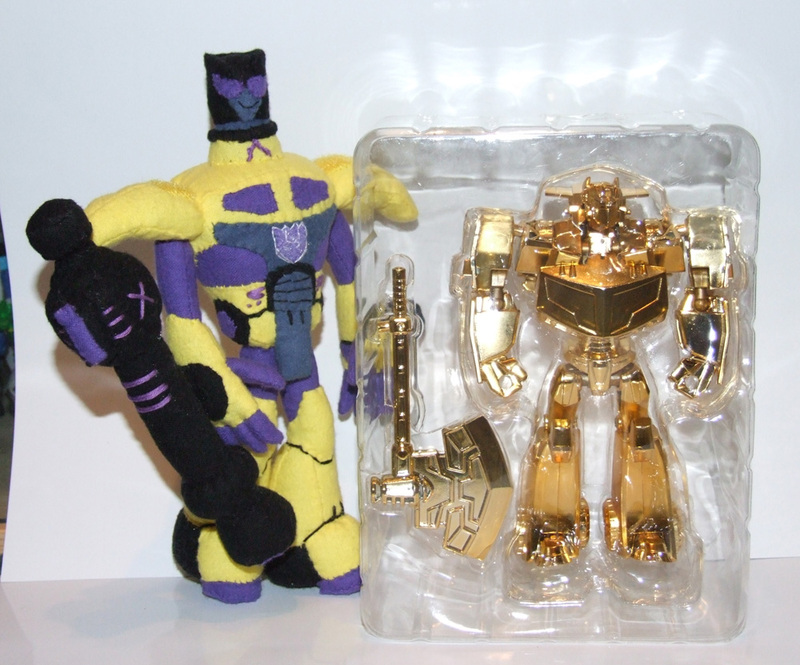 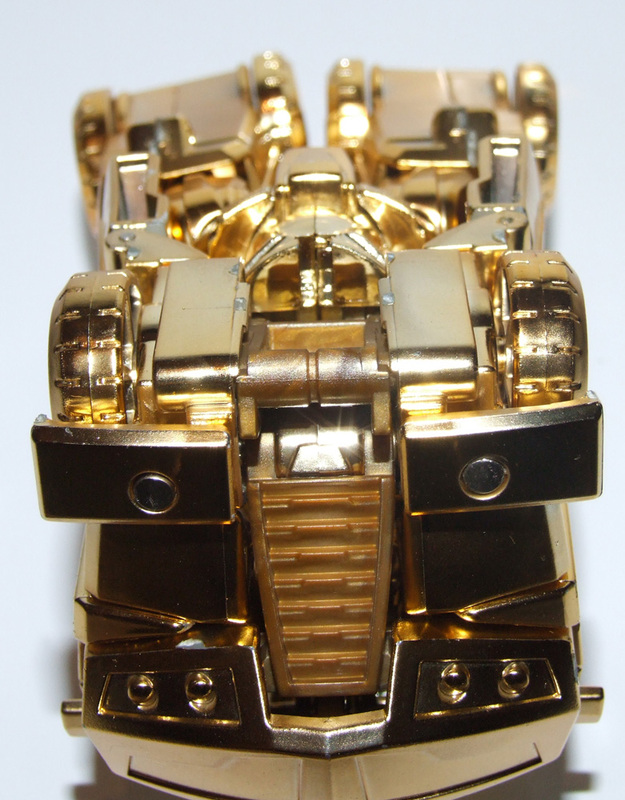 As I recall I spoke to Jim on the Thursday night about this very figure as well as the chrome silver Bumblebee and said that I was already on the look out for the figure and that he could be assured that I would track one down sooner rather than later. 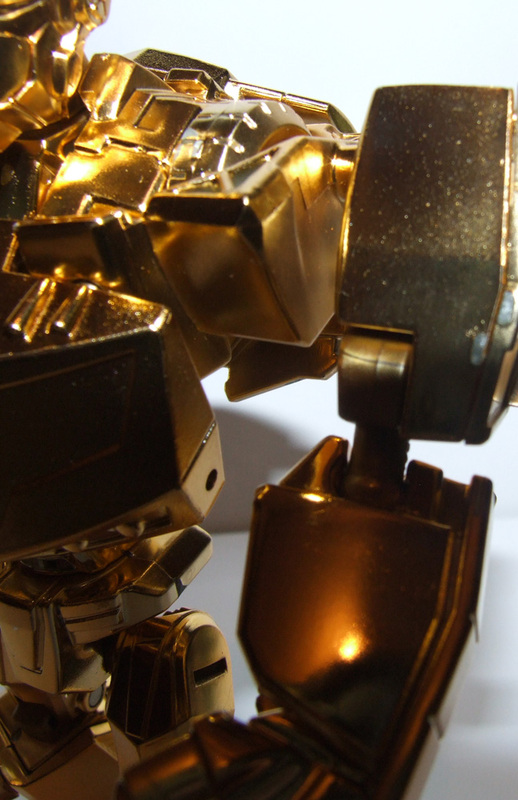 Well I didn't have to wait to long and now you all can enjoy the worlds first full image gallery of this limited figure. 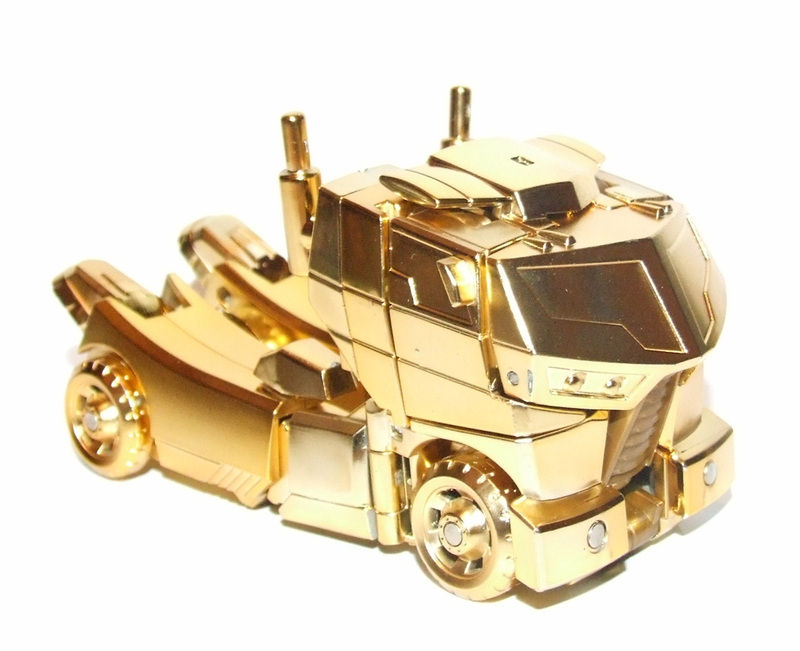 A warning to anyone looking to buy this toy, it is not designed to transform much. 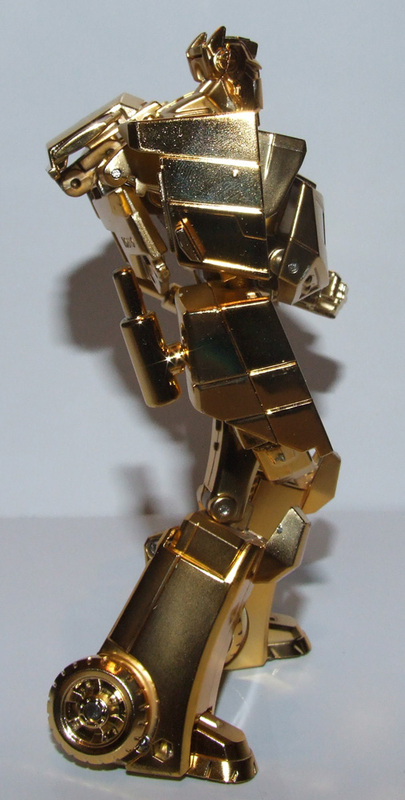 If you buy one be very careful handling the figure as it is extremely stiff in places (the legs, feet, arms) as the gold chrome is thicker than pant or just plastic. 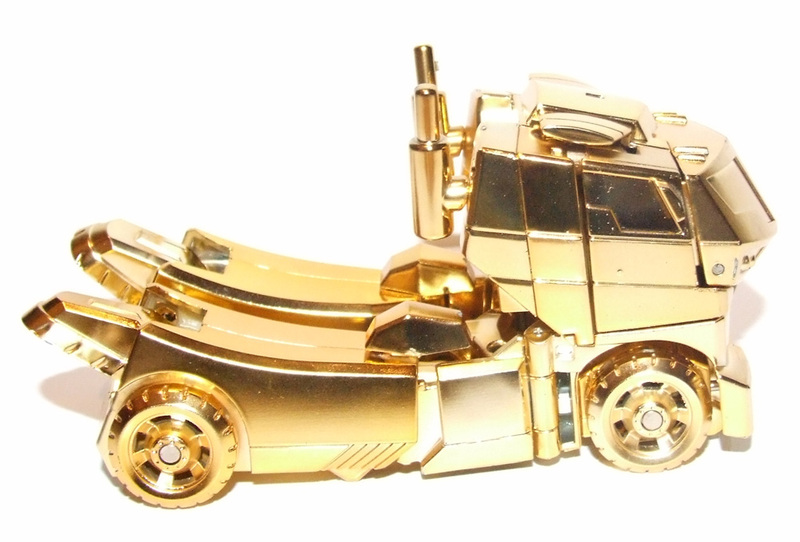 I'm putting this note first as when you look at the images you will see that I did not transform the toy fully into truck mode. 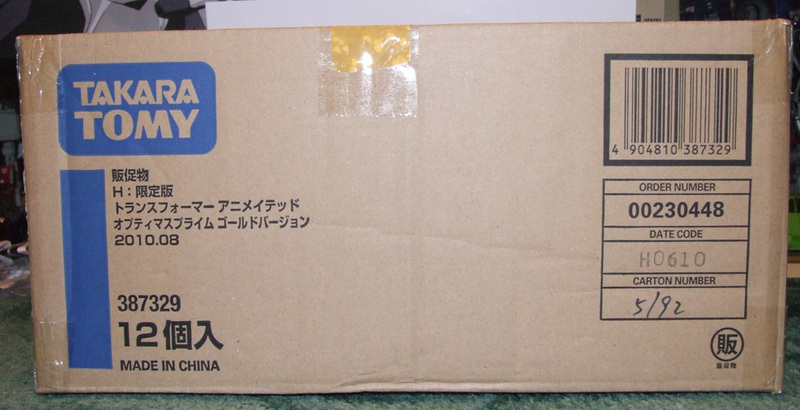 This is because I feared damaging it. 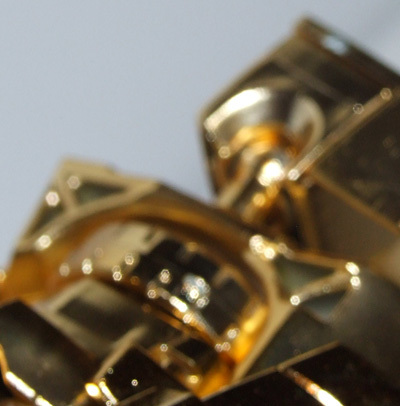 You could loosen the screws to help in some places but the feet are a worry. 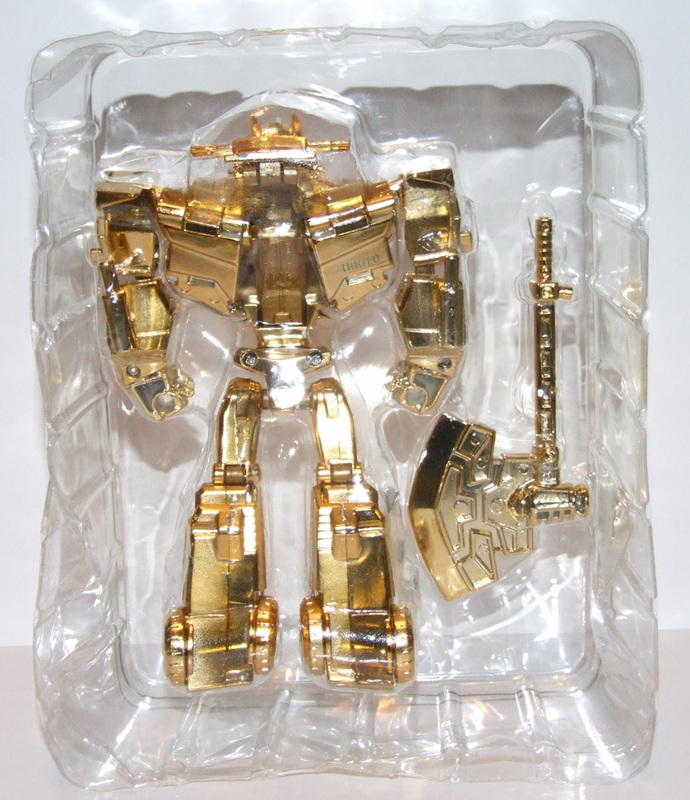 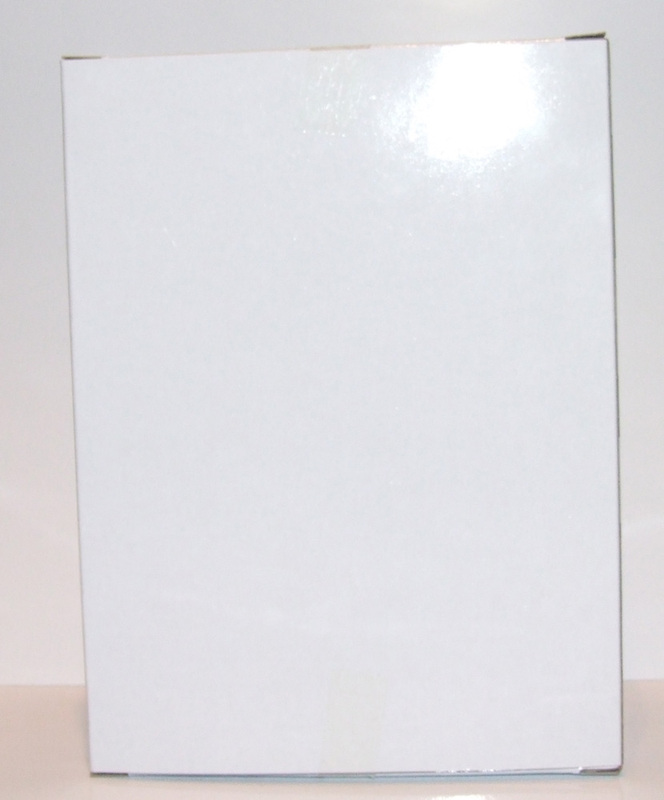 The base figure: The toy is NOT a chrome over normal release. 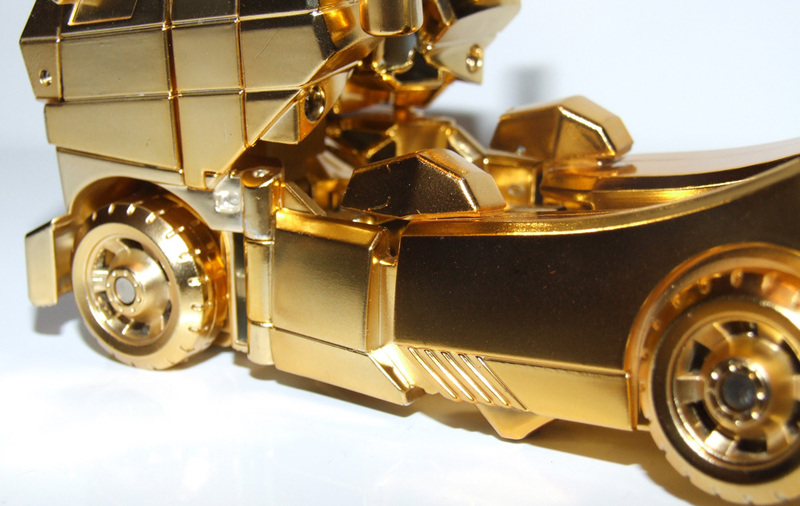 As you will see from the images, the toy is made from a uncoloured plastic and was then chromed over. 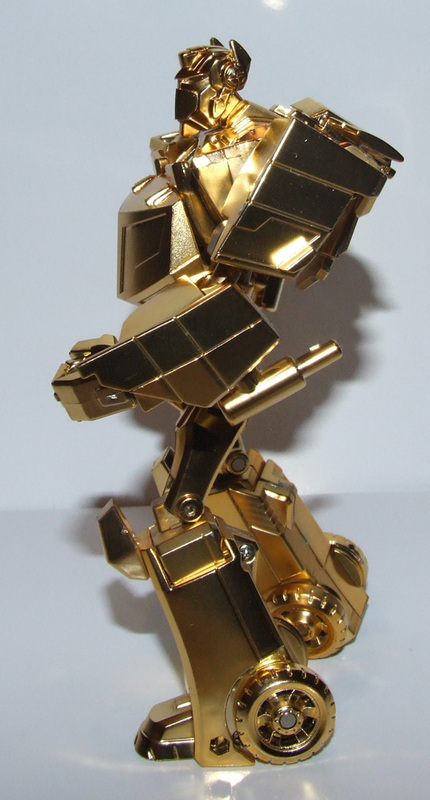 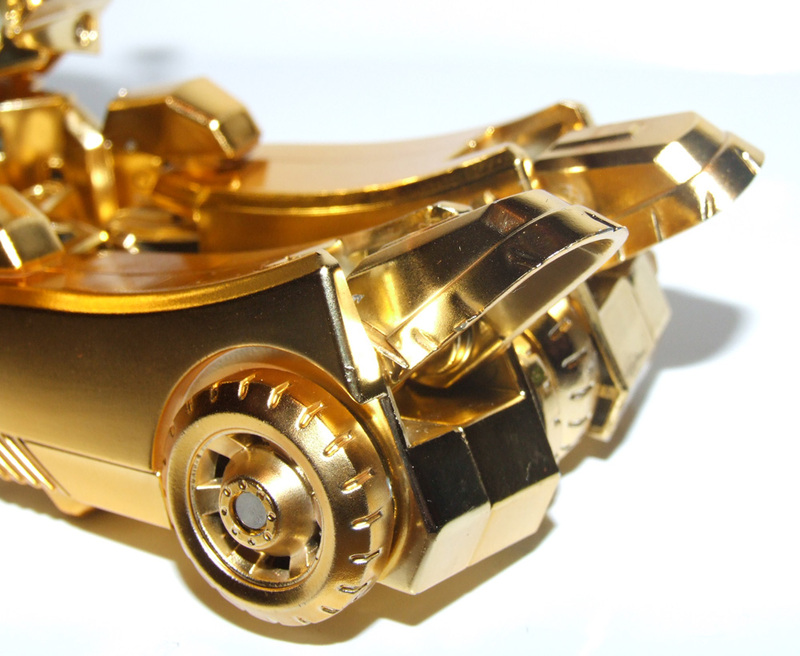 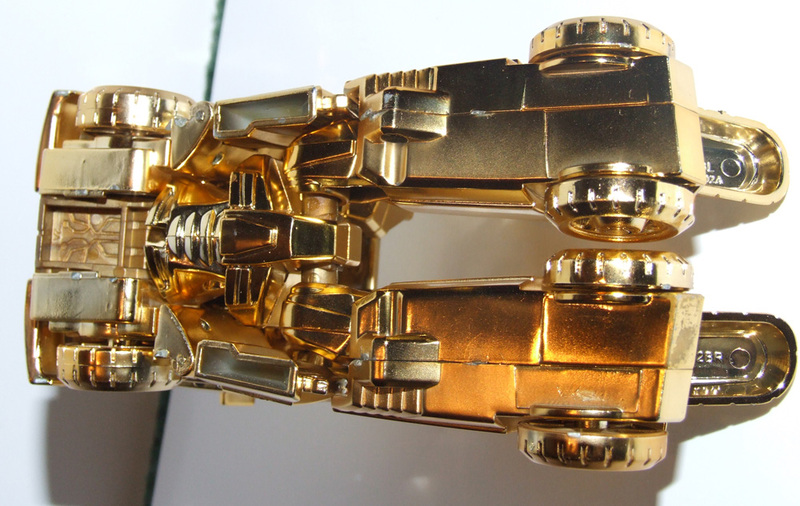 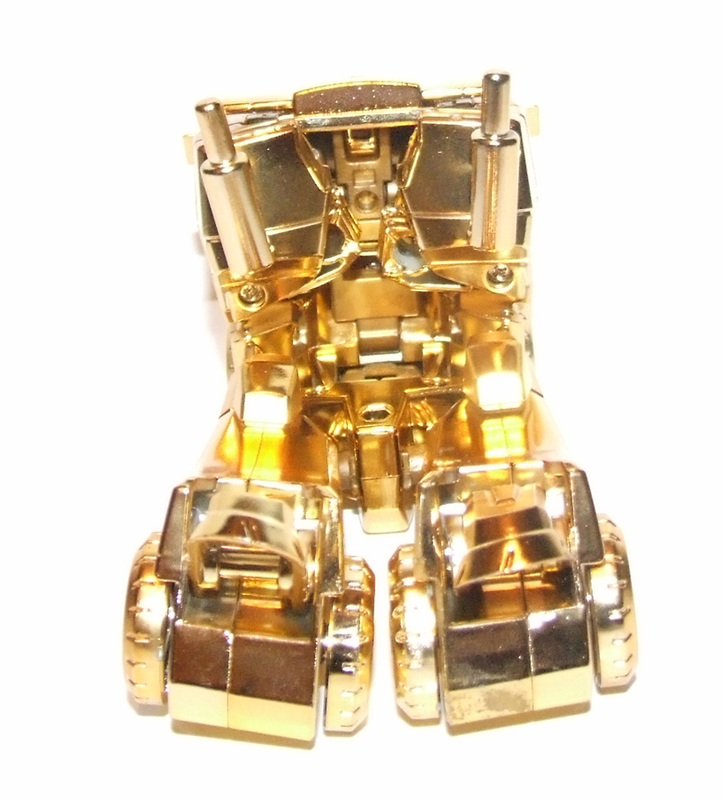 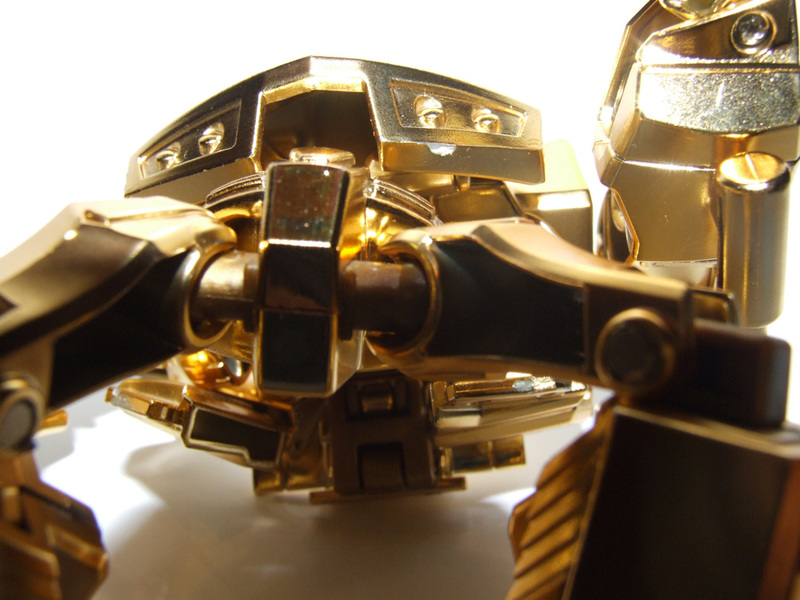 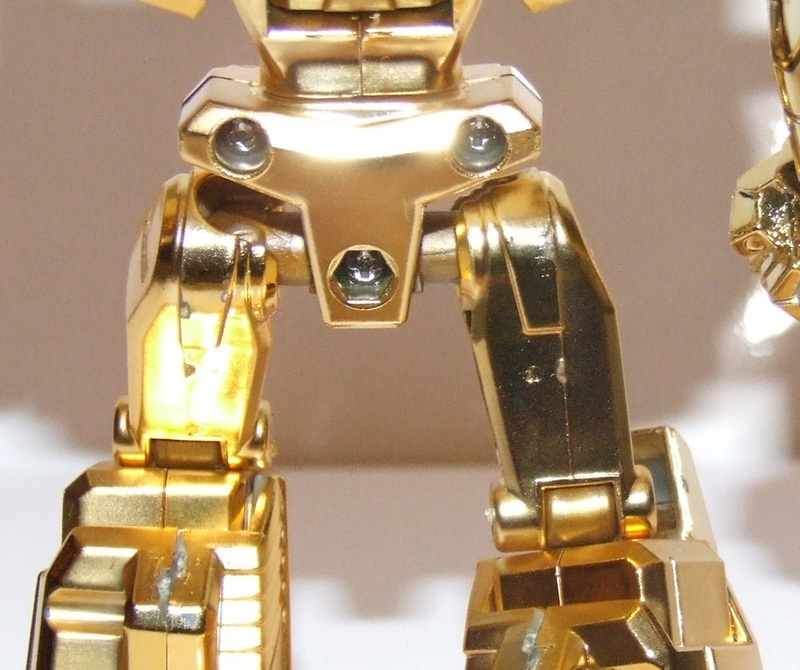 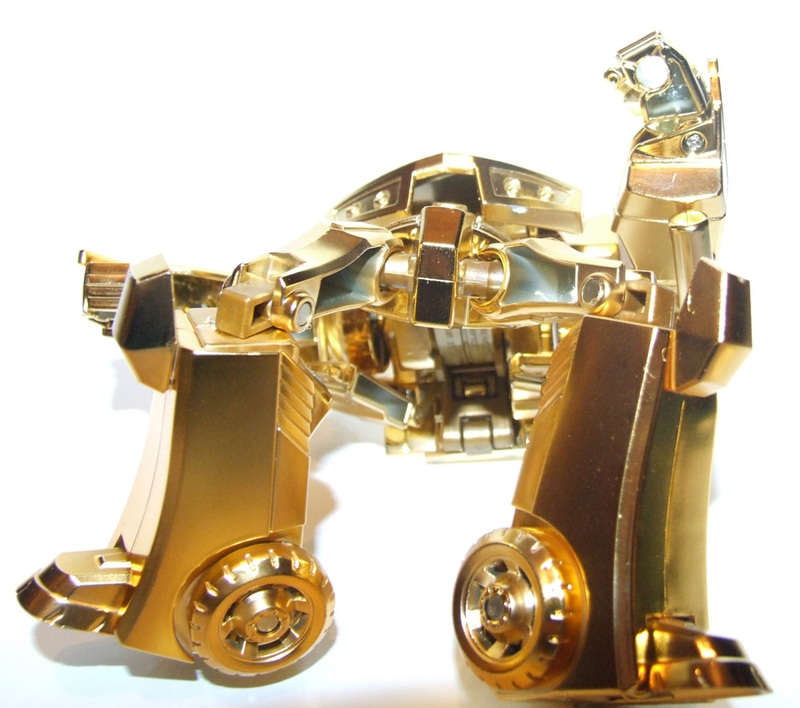 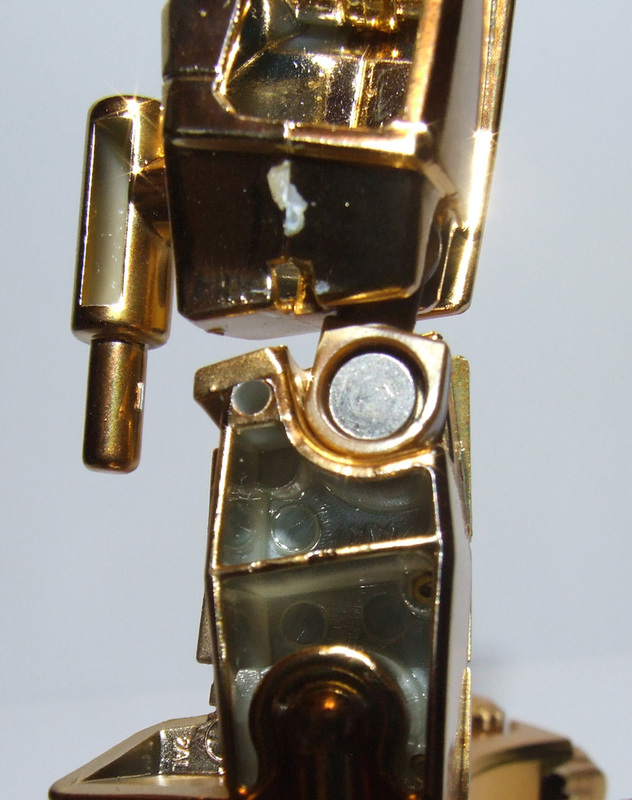 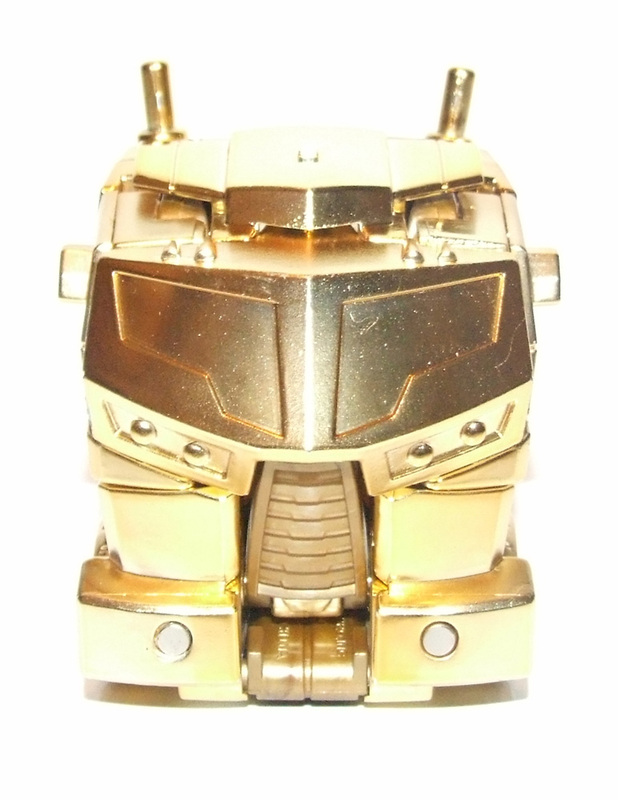 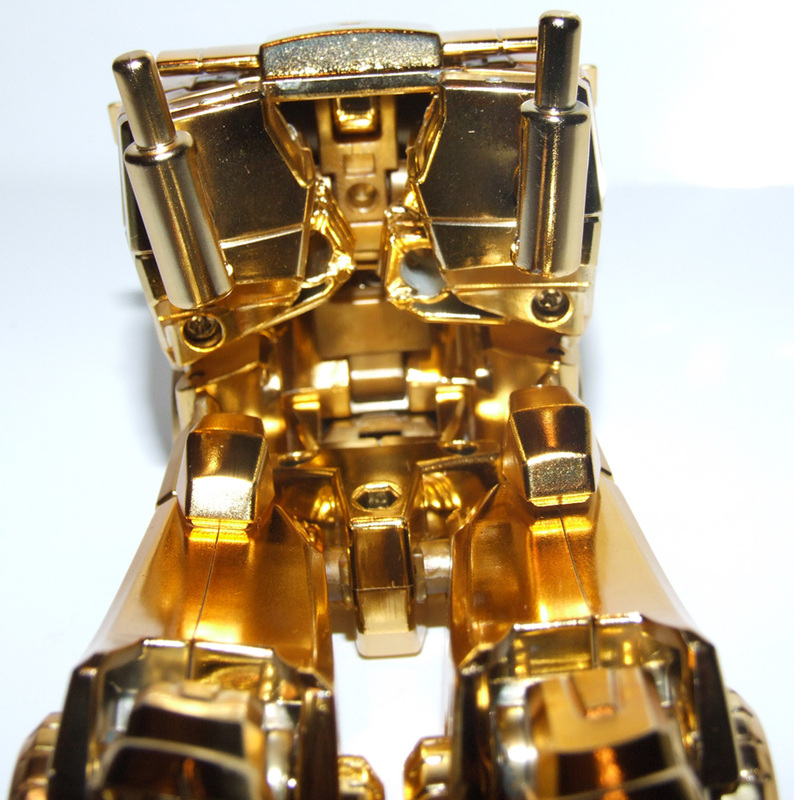 The joints on the knees, elbows and main body slider are made from a gold plastic that appears to be deeper in colour than any previously used plastic by TakaraTomy. 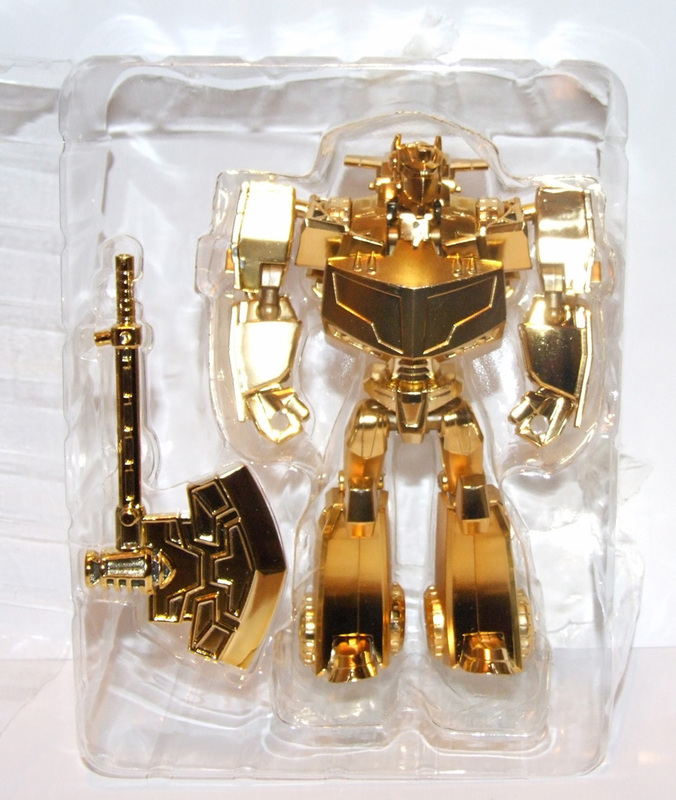 I haven't compared it directly against other gold lucky draw figures yet and am going from memory, but if this is the case then this will be very important if fakes are produced. 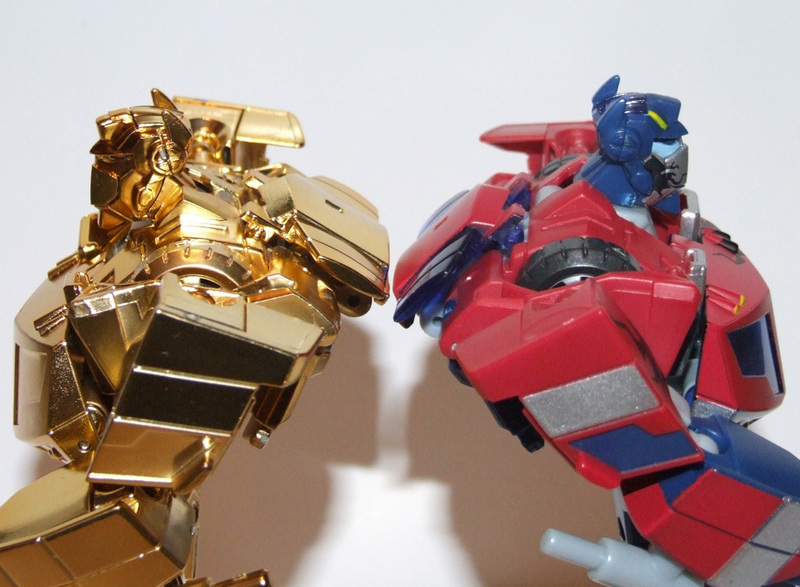 Stiffness aside the toy is fantastic! 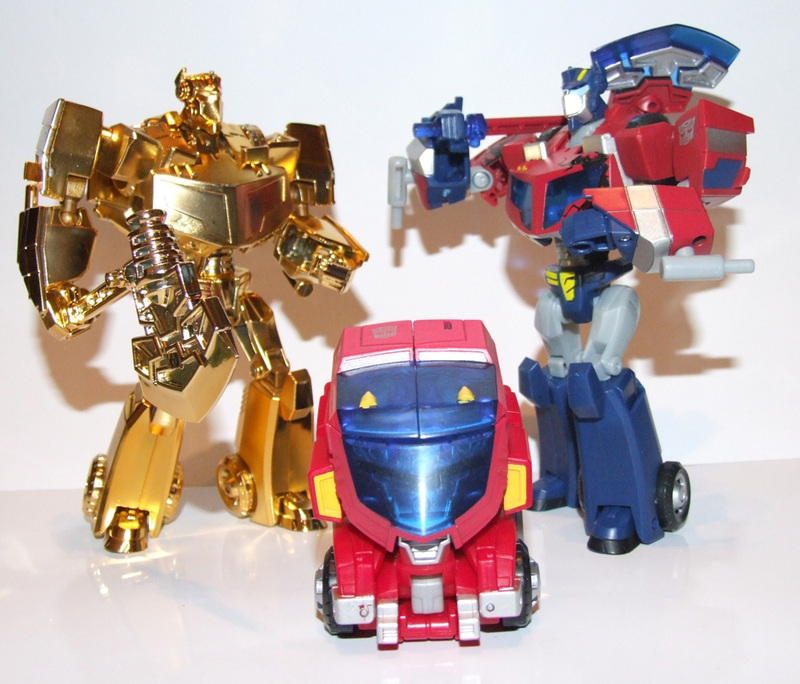 The Transformers Animated designs were always amazing and the toy sculpts reflect that style so well which actually means that Prime is instantly displayable as soon as you take him out the box. 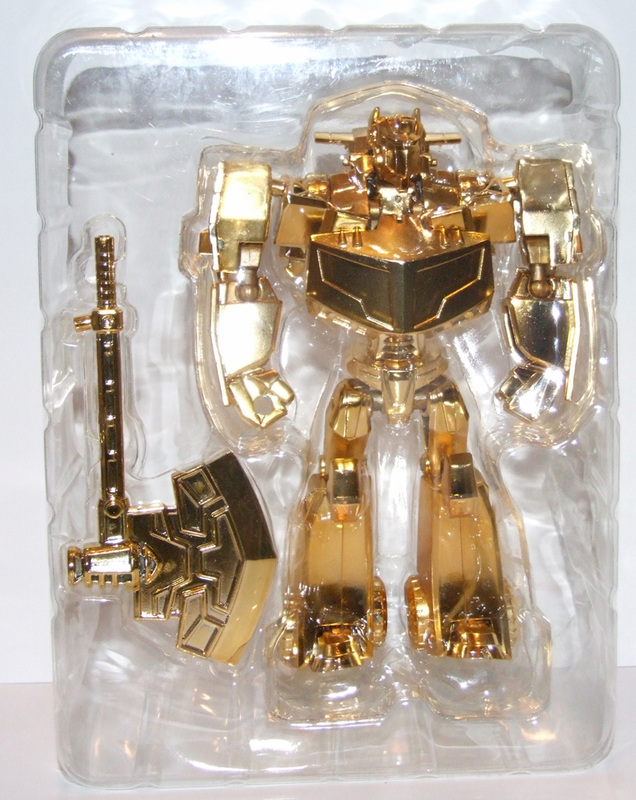 The gold chome on the axe has been applied beautifully so that not only does the weapon still fit into Optimus' hands, but it still retains a gap meaning it does not scratch. 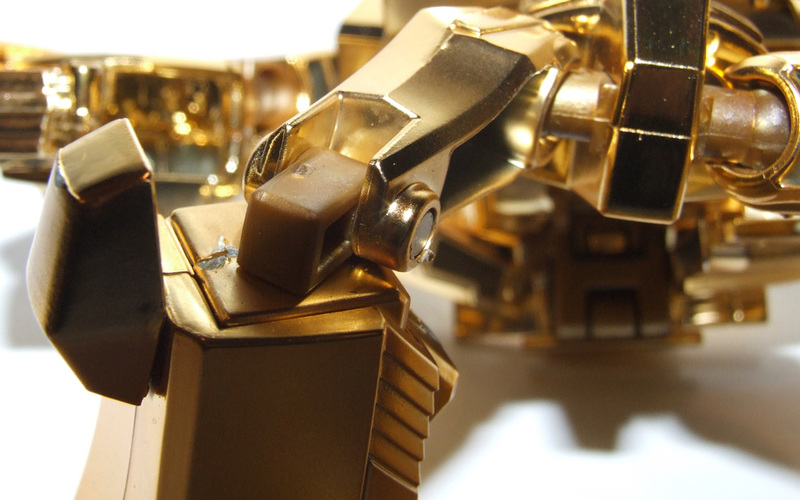 This is also helped out by thr fact that the hands are not chromed fully inside. 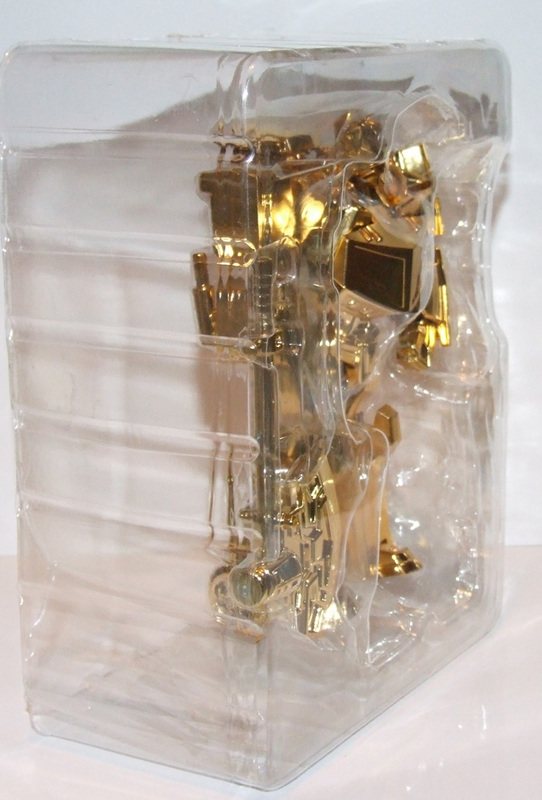 If you own the normal deluxe figure, and I expect most of you reading this will, you will know that the toy has a twist-at-the-waist spring "battle punch" action. 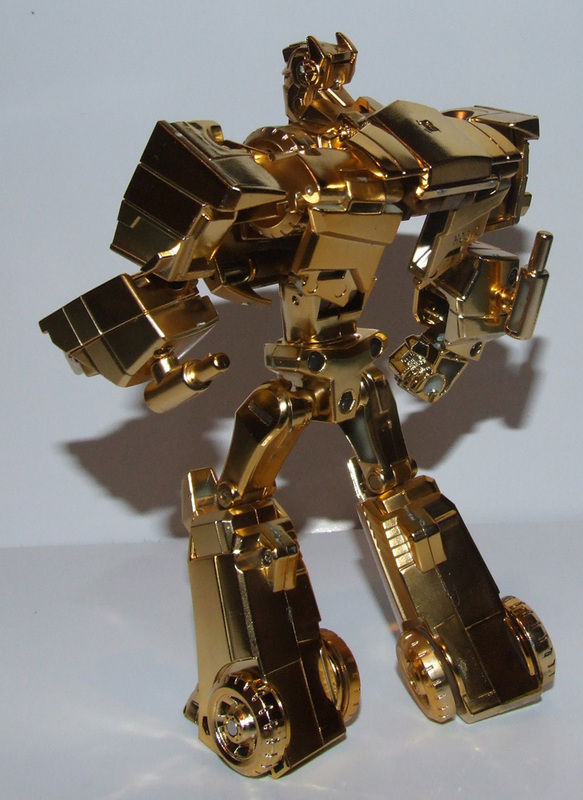 This still works on the Lucky Draw figure, but it just needs extra care. 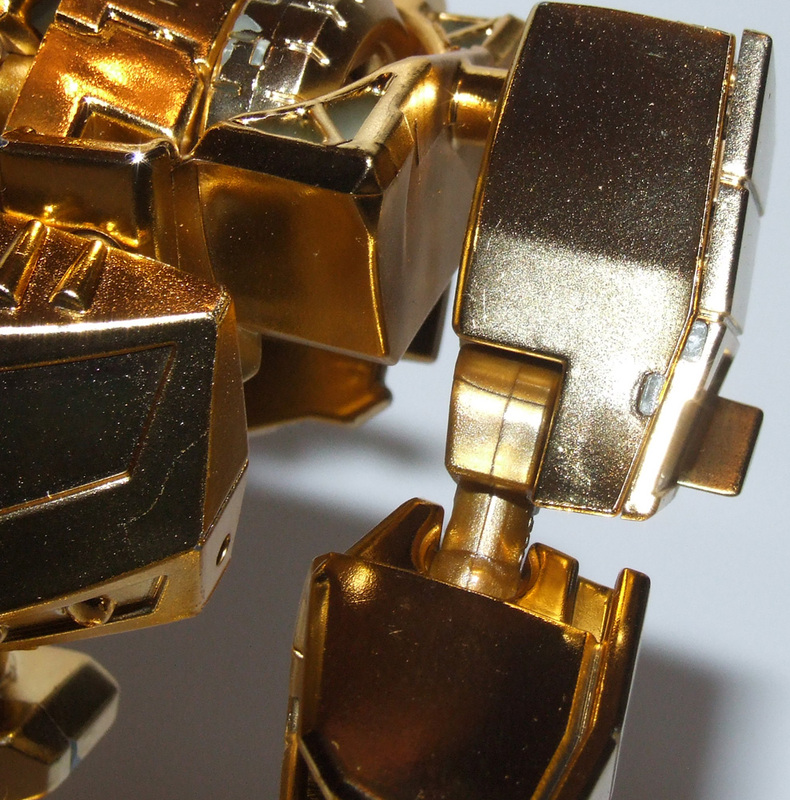 Like any toy that is chromed on the spruce you will see snap marks and some areas of the figure are not as smoothly chromed as others. 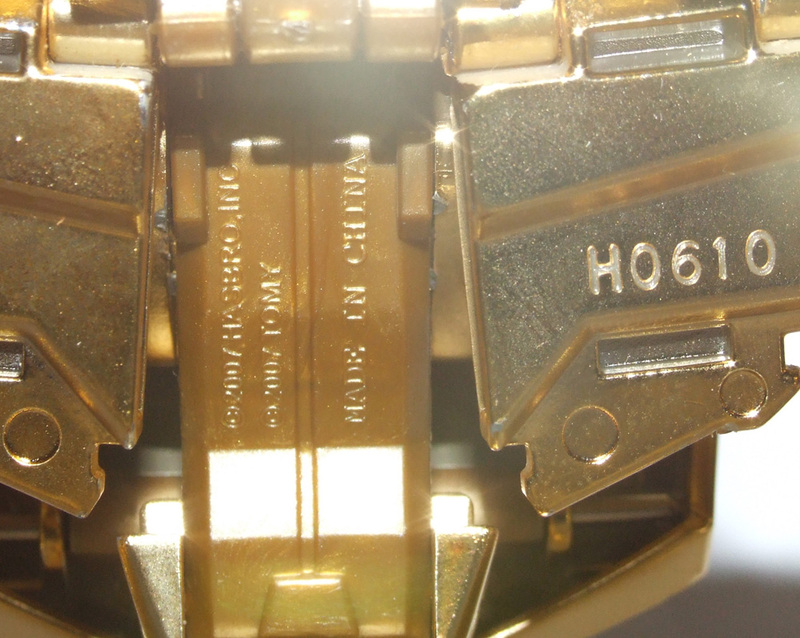 On the case of our one, the back of one of the feet has the chrome applied unevenly on one side. 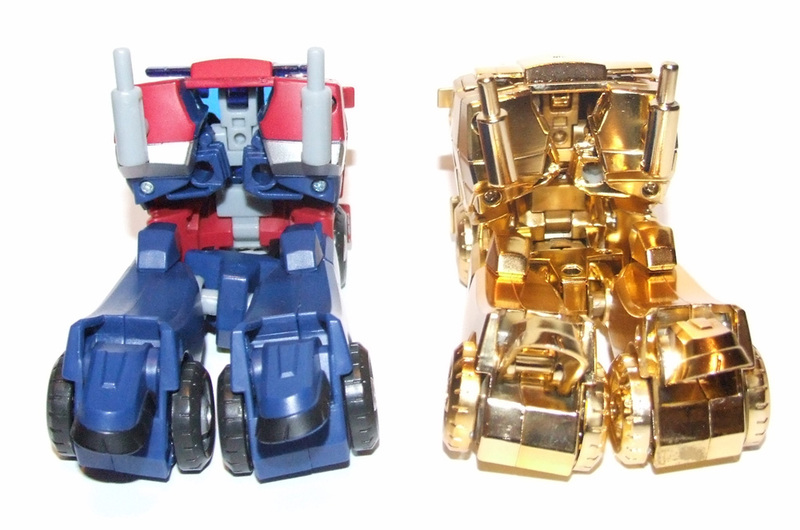 I've taken some comparison images to the original western Battle-In-The-Box Battle Damaged Optimus Prime figure so you can hopefully visualise him easier. 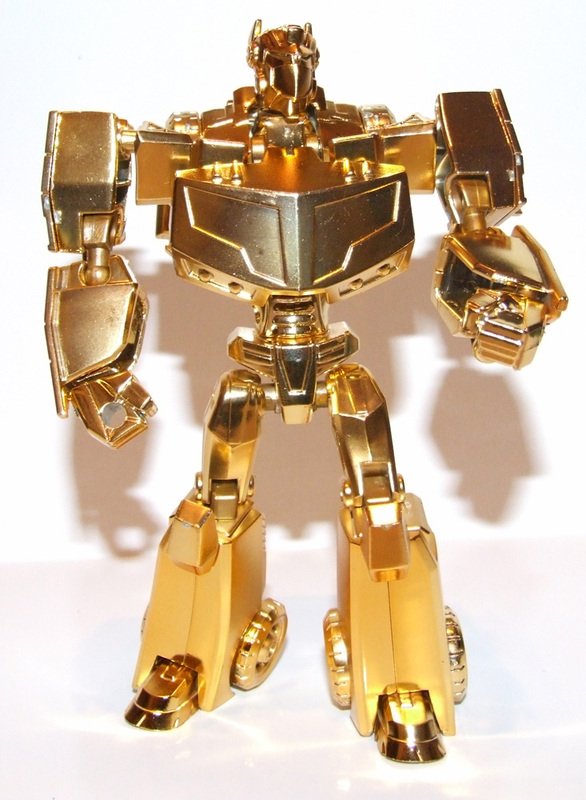 If you are a collector of Lucky Draws or a collector of Transformers Animated figures I encourage you to seek this toy out, he is more than a worth addition to anyones collection. 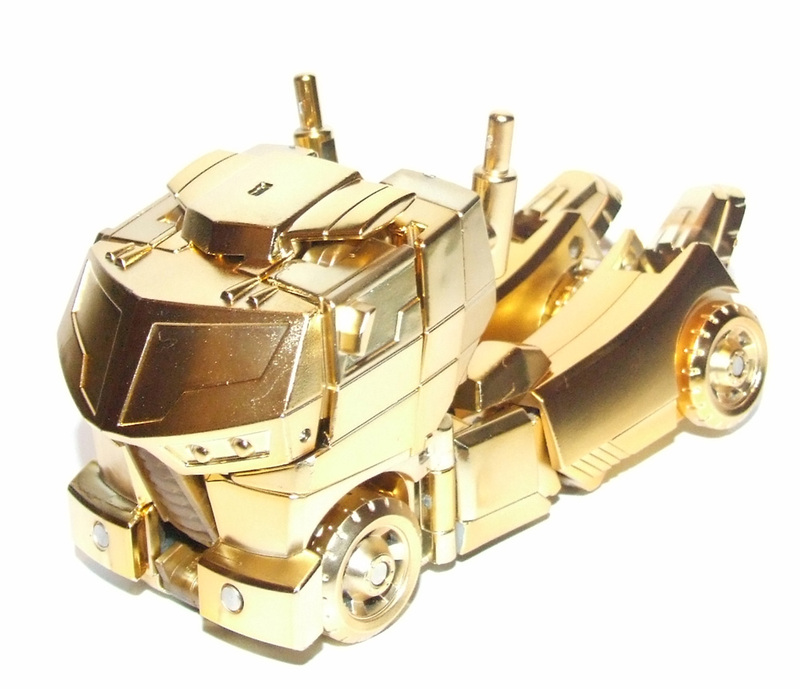 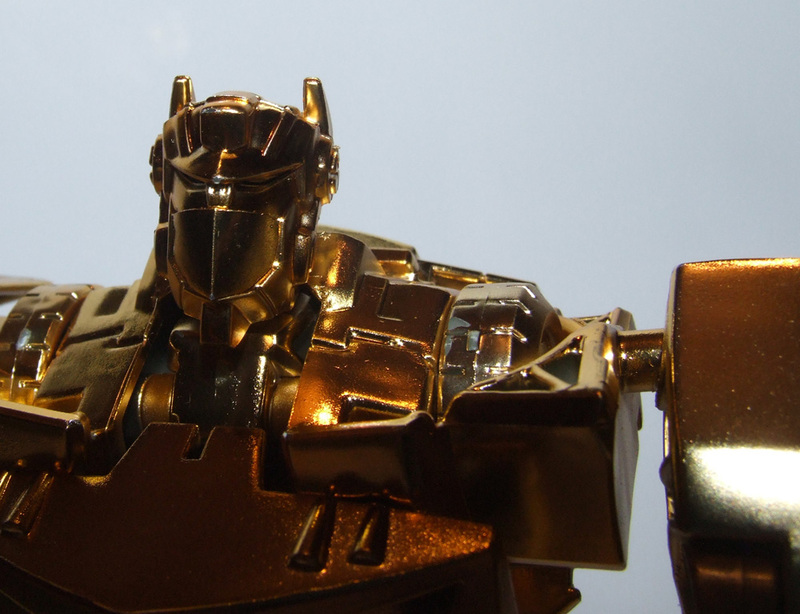 He also makes me look forward to getting my hands on the Silver Chrome Bumblebee and what I expect will be the gold Voyager class version at the end of the year even more.